The Live Shows continues as The Voice of the Philippines Season 2 tries to find its title holder. The second half of Top 6 of each team will try to out do each other to secure the spot for the next round of the competition. 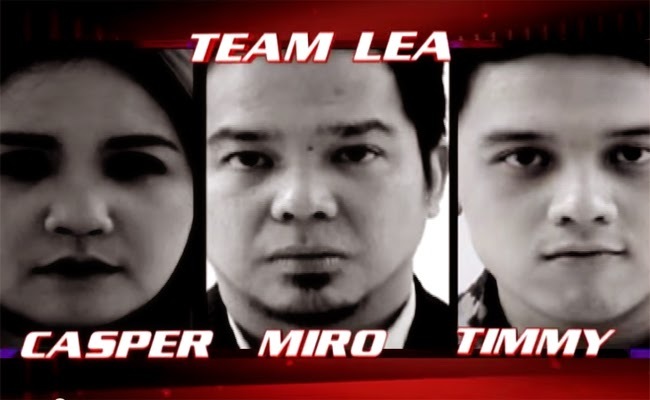 Team Lea’s Casper, Miro Valera and Timmy got their chance to give their best ever shot to stay in the competition and get enough votes from the viewers. Miro sings ‘Wake Me Up’ to share his passion for music. Lea wanted him to make people think that the lyrics are very memorable and heartfelt. Apl said that he did an awesome job which seemed like smooth sailing and his presence seemed to spill all over. Lea shared that she had enjoyed the performance and he had managed to level up himself. Furthermore, his energy seemed to have waken up everybody. Casper sings ‘Chandelier as her chosen song to share her past experience. Lea said that Casper was able to blend her technical skills Bamboo said that her rendition was amazing and reminded people that she was once from his team. Lea said that she belongs to her team now. She also said that Casper is one of the most dangerous artist in the competition. Timmy sung ‘Dulo ng Walang Hanggan’ and dedicated her performance to his family. Sarah said that he sounded passionate with his song. Lea said that she seemed feel the love through his song. She said that it was a great performance and must be one of the best. The voting lines are now open. The viewers can now choose who between Casper, Miro and Timmy are they going to give their prescious votes. The most number of votes will save the artist from being left behind.